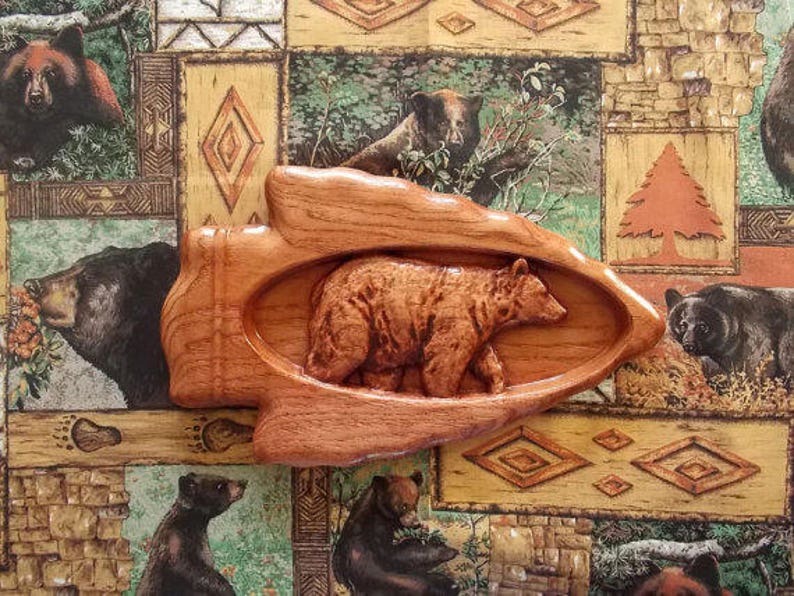 Black Bear Decor, Black Bear, Bear, Cabin Decor, Bear inside Arrowhead, Wood Carving, Wood Wall Art, Hickory, D Mahogany, Satin, 10.5 x 6"
Absolutely gorgeous! Beautiful craftsmanship! We love it! Can't wait to hang it on our new fireplace! Most custom orders will be shipped out in 3-5 business days or SOONER depending on our shop schedule at the time you place your order. Expect longer waiting times during peak holiday shopping seasons. Huge 40% Spring sale beginning on April 18, 2019 - May 18, 2019 plus free domestic shipping. Shipping will be 2 - 3 week or SOONER depending on our shop schedule. We will do our best to get your orders out as quickly as possible but since we carve each piece individually, there will be additional waiting time so that everybody can enjoy this amazing sale!! Thank you for allowing our company the opportunity to work for you. These cavings are FAR more beautiful than I expected! I haven't decided where I will use them yet. I am redoing my home and will decide where they go when I see the best place so that I get to enjoy them every day.!! !